Our passion for research is based on a desire to know. Through research we discover things we did not know before, and through interpretation of those findings, we can offer sound and sustainable business solutions. When should you reach out to a Research Consultancy? Do you have a product or service that isn’t seeing the success it should in the marketplace? Do you need to find your perfect target market? We will provide the answers as to where you’re situated and why you’re there, and offer business solutions to effectively align your strategy with your objectives. Research provides a means to understanding. Successful companies engage in research and development because it is critical for the product innovation process and to aid the improvement of services. If you want a competitive edge in your marketplace, you need to do research. Developing sound business strategies can only boost your profitability and ultimately this improves the economy overall. Research unearths the truth, and lays to rest invalid claims. We have stringent measures in place to ensure that our data is correct, and that the quality thereof is uncompromised. Through research, we gain understanding of situations and therefore are able to create opportunities – be they addressing social issues, assisting academia, or working in the consumer or business terrain. Who needs our research services? We know that the future needs our research. People need health services, security, energy, communication, the environment and mobility. Research is a systematic science, involving quantitative and qualitative analysis. Give us your problem and let us help you solve it. We follow a systematic approach to our work. This creates a smooth, reliable process and yields the best results. Once we have established the needs that are to be dealt with, in other words, the research problem, we can go about establishing the best way of navigating the project. We decide on the methodology to be used. 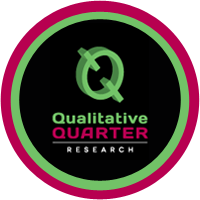 Qualitative Quarter has some very exciting projective techniques that we use to extract the richest information. We then bring in the most appropriate expertise to assist us with the research. Scope, limitations and feasibility are determined at this point as well. We use the resources and expertise at our disposal to effect data collection. Data collected is analysed, interpreted and a report is created. Presentation to stakeholders concerning findings and the suggested solutions. Once all findings have been analysed and reported, we will recommend a way forward. We also point out the opportunities and pitfalls that could be encountered en route. A future strategy is established through collaboration of all stakeholders. Enhancement and mitigation measures to be put in place are established at this point in the process. We undertake impact assessments as part of a tracking process. Ths is to assess that all outcomes that have been agreed upon are sustained and kept in place in the long term.